Generous donors created scholarships to honour the first five women graduates in civil engineering—and to celebrate those following in their footsteps. The first woman to graduate with a U of T civil engineering degree was Marcia Lamont Scott (BASc 1947). Her success fulfilled a childhood dream inspired by her grandfather. “I used to play with his drafting equipment,” she told The Civilian in 2015. Despite that positivity, it took another generation before civil engineering could count five female graduates. First came the trio of Hanna Wejtko De Angelis (BASc 1960, MASc 1963), Marlene Metzger (BASc 1960, BEd 1975, MEd 1980) and Margaret Kende (BASc 1960), later an active U of T volunteer who won an Arbor Award for her efforts to promote and support women in engineering. Sue Joel (BASc 1965) earned her degree five years later. 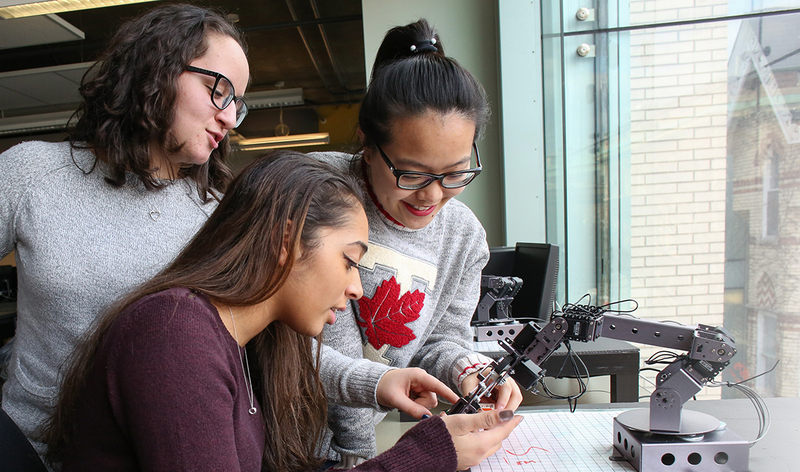 Since then, especially in recent years, the number of women studying and leading in the Faculty of Applied Science & Engineering has grown considerably. So to honour those first five, generous Boundless campaign annual giving donors set up five scholarships in the Department of Civil & Mineral Engineering.